With its focus on environmental protection and green growth, the 2018 Forum on China-Africa Cooperation saw a great deal of interest in bamboo and rattan. 10 September, Beijing – The 2018 Forum on China-Africa Cooperation, FOCAC, was hosted in Beijing, China last week. INBAR was one of a number of international organisations to attend the Forum, which emphasised the importance of bamboo and rattan for green development. Bamboo was mentioned directly in Chinese President Xi Jinping’s speech, and bamboo and rattan are discussed in the Forum’s Beijing Action Plan, which was agreed by state leaders. There are over 30 million hectares of bamboo and rattan across the world. Like China, a large number of African countries boast native bamboo and rattan species, and use the plants for a wide range of purposes, including as a source of energy, for housing and to restore degraded land. However, most regions have yet to realise bamboo and rattan’s full potential for poverty alleviation and green socio-economic development. With an industry valued at USD 30 billion and employing almost ten million people, China offers an important example to other countries wishing to emulate this growth. Over the past 20 years, African farmers, entrepreneurs, policy makers and development practitioners have learned from China’s extensive bamboo and rattan market experience, through INBAR training and programme activities as well as the exchange of important technologies. Given the increased interest in environmental protection and sustainable, nature-based growth over recent years, it is understandable that bamboo was a focus of the 2018 FOCAC. This was made particularly clear in President Xi Jinping’s opening speech. In the speech, President Xi announced “the construction of a China-Africa Bamboo Center, to help Africa develop the bamboo and rattan industry” as one of a number of major new Sino-African environmental projects. The Centre, which will be based in Addis Ababa, Ethiopia, will serve as a focal point for training, research and demonstration projects about the potential for bamboo, “to help Africa develop the bamboo and rattan industry.” China has earmarked several million dollars of investment for the Centre. Significantly, bamboo and rattan are also mentioned in the Beijing Action Plan, which was signed by China and all African heads of state on 4 September. The Plan sets out a range of aims, which China and African countries will work together to achieve. It includes the pledge that China and Africa “will work together to … actively support Africa’s capacity-building in the sustainable management of bamboo and rattan resources, the innovative development of bamboo and rattan industries, the development of their products and poverty alleviation, and relevant industrial policy and standardisation.” Bamboo and rattan’s inclusion in the Beijing Action Plan is a clear sign of the plants’ potential for poverty alleviation and economic growth. Several African leaders also expressed a real interest in bamboo and rattan’s uses. During the Forum, INBAR Director General Hans Friederich had an audience with the President of the Republic of the Congo, Mr. Sassou Nguesso, to introduce the benefits of bamboo. With a large amount of forest, the Republic could benefit greatly from better bamboo and rattan management and use. And on Wednesday 5 September, INBAR welcomed the President of Madagascar, Hery Rajaonarimampianina, to visit INBAR Headquarters. The President toured the nearby bamboo and rattan showroom and learned more about the importance of these plants in Africa. Rajaonarimampianina’s visit follows that of Cameroon President Paul Biya in March. 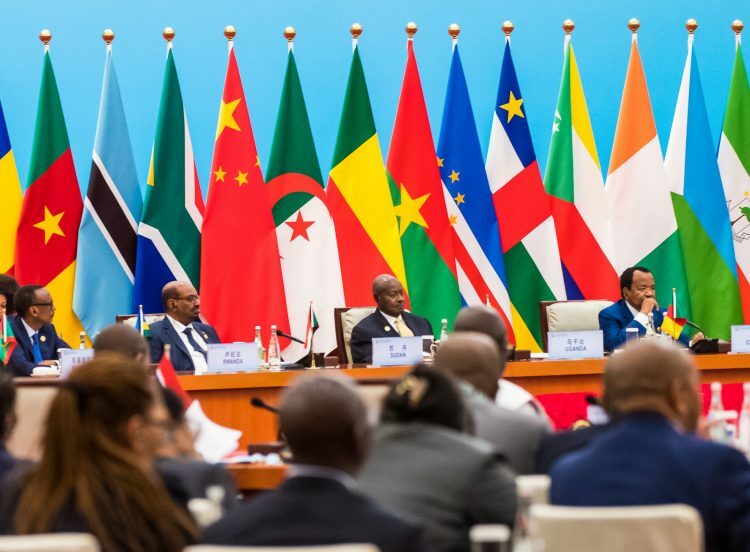 Finally, the Summit was a chance for INBAR to celebrate its 19 African Members, and announce new plans to strengthen collaboration. 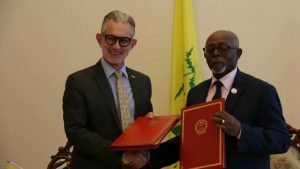 On Sunday 2 September, INBAR formally launched its Central Africa Regional Office, in an event co-hosted with the Embassy of Cameroon in Beijing and arranged with The Cameroon Minister for External Relations, Lejeune Mbella Mbella. As well as providing a base from which to coordinate bamboo and rattan activities, the Office should serve as a useful contact for greater collaboration between Central Africa and China. According to Minister Mbella Mbella, the office “should help in our efforts to build effective and economically sound value chains” using bamboo and rattan. The office will be the third INBAR base in Africa, supporting the ongoing trilateral Dutch-Sino-East Africa initiative, a bamboo project with the International Union for the Conservation of Nature and Global Environment Facility in Cameroon, a new IFAD-funded project across four countries, and an agreement which was signed with the Gaborone Declaration for Sustainability in Africa during the Global Bamboo and Rattan Congress. Fittingly, this week INBAR will also host a flag raising ceremony for its newest member: the Central African Republic. The Republic is the 44th Member of INBAR, and – like many countries on the continent – can benefit from realising the potential of its native bamboo and rattan resources.